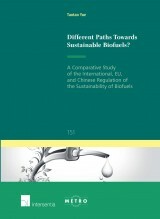 Different Paths Towards Sustainable Biofuels? juni 2016 | 422 blz. Biofuels are promoted as a type of renewable energy from biomass that replaces fossil fuels in transportation, in an attempt to achieve the three-fold objectives of energy security, rural development, and GHG emission reductions.